EghtesadOnline: Armenia’s Prime Minister Karen Karapetyan has traveled to the Iranian capital for talks with Iranian officials. 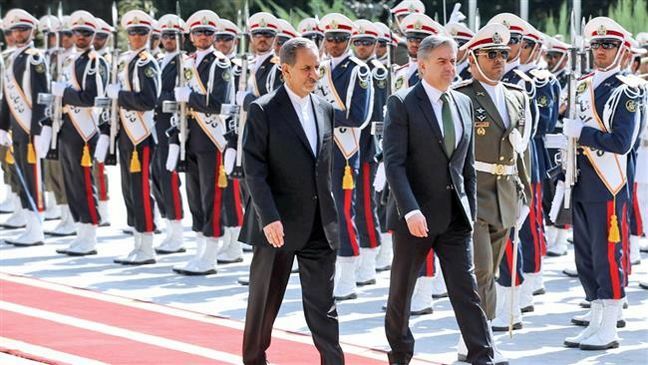 Karapetyan reached Tehran on Monday at the head of a delegation, and was received by Iran's First Vice President Is’haq Jahangiri. According to ISNA, the officials then joined a first round of bilateral meeting, and Karapetyan’s accompanying delegation held separate talks with ranking Iranian authorities. Three memorandums of understanding were signed between the two sides focusing on cooperation in the areas of veterinary medicine and livestock health, bilateral exchange in the area of art and culture, and science and technology. Armenia’s Ambassador to Tehran Artashes Tumanyan had earlier demanded enhancement and facilitation of bilateral trade, and urged that his country get to avail itself of Iranian businessmen’s experiences. The level of reciprocal investment, he said, stood at a low level due to a lack of relevant information by each side of the other’s production and tourism capabilities and capacities. The envoy reminded that Armenia could, as a member of the European Union, act as a portal for Iran towards Eurasian markets. Speaking to IRNA back in August, Armenian President Serzh Sargsyan, who had traveled to Tehran to attend President Hassan Rouhani’s inauguration ceremony, said relations between Armenia and Iran served as a model of good-neighborly ties and lauded the peaceful coexistence of Armenians and Muslims in Iran. He said the friendship among Armenia, Iran, and Russia served the fight against extremism in the region, and thanked Tehran for its principled policy on the Nagorno-Karabakh dispute. The Islamic Republic has invariably advised Armenia and Azerbaijan to resolve their dispute over the region, over which they fought a deadly war in the 1990s, through dialog instead of resorting to arms. Nagorno-Karabakh is internationally known as part of Azerbaijan but the territory is currently controlled by pro-Armenian separatists.